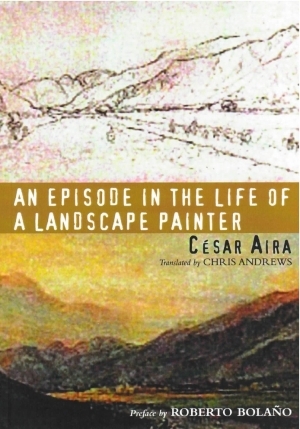 More than once I’ve seen a blogger recommend An Episode in the Life of a Landscape Painter to readers newly discovering César Aira. I wonder if that’s because the plot appears more straightforward in comparison to his other books? Of the three I’ve read it definitely has the most linear trajectory, moving in a (fairly) straight line from start to finish. It’s easy to track the rise, peak and decline in the action – not something you can take for granted with this author. Of course, no story is completely straightforward. A no frills summary of An Episode in the Life of a Landscape Painter would tell you that it’s a fictionalized account of Johann Moritz Rugendas’, the19th century German landscape painter, visit to Argentina. A fellow countryman, the naturalist Alexander von Humboldt, suggested he go to paint the Latin American terrain. And so Rugendas traveled there with a companion, a minor artist who ultimately proves himself the best of friends. At the story’s climax Rugendas and his horse are struck by lightning. The plot veers, turns in a completely unexpected direction. An Episode in the Life of a Landscape Painter becomes wondrous. Extraordinary. Grotesque. The variations revolved around a curious impossibility: how could he communicate the proposition “I am a monster”? It was easy enough to set it down on paper. But transmitting its significance was far more difficult. In the case of his Chilean friends the problem was pressing, and he took particular care over his letters to them, especially the Guttikers, who had already written inviting him to stay at their home in Santiago, as he had before setting out on his journey a few months before. Since they would be seeing him shortly, he felt he had to warn them. The obvious thing to do in this case would have been to exaggerate, in order to diminish the surprise. But it was not easy to exaggerate… He ran the risk of falling short, especially if they were allowing for obvious exaggeration. I could quote the passage where Rugendas is struck by lightning, which is – quite frankly – beautiful. Or describe what happens afterward. But who am I to deprive readers of those surprises? Honestly, if I’ve done my job I shouldn’t need to discuss plot points to pique your interest. Even if it had no narrative substance – and oh it does! – Aira’s prose is enough of an enticement for any reader. While the signature writing style is always the same, (introspective, flowing, lyrical) every Aira book still manages to be unique. Ghosts is an avant-garde ghost story set in the present day; Varamo reads like a rambling, paranoid delusion; and An Episode in the Life of a Landscape Painter is a 19th century painting – all ochre and burnt sienna layered over a rapidly drawn charcoal sketch. It was not really rain so much as a benign drizzle, enveloping the landscape in gentle tides of humidity all afternoon. The clouds came down so low they almost landed, but the slightest breeze would whisk them away… and produce others from bewildering corridors which seemed to give the sky access to the center of the earth. In the midst of these magical alterations, the artists were briefly granted dreamlike visions, each more sweeping than the last. Although their journey traced a zigzag on the map, they were heading straight as an arrow towards openness. Each day was larger and more distant. As the mountains took on weight, the air became lighter and more changeable in its meteoric content, a sheer optics of superposed heights and depths. By this time it must be obvious that I can’t get enough of César Aira. Don’t worry. I’m not alone. The popularity of, and respect for, his work increases in the United States with each new English translation. Currently there are seven books available in English (six through the publisher New Directions & one from Serpent’s Tail), and a short story appeared in the New Yorker just this past December. A new book, The Miracle Cures of Dr. Aira, comes out in the Fall of 2012. Needless to say – this man is a ridiculously prolific writer. His extensive bibliography consists of dozens of untranslated works and extends all the way back to 1975. And he is still young – only sixty-three! Isn’t it lovely to know that there’s so much material in existence, patiently waiting to be enjoyed by all? Note: the New Directions edition comes with a preface by Roberto Bolaño, who calls Aira “one of the three or four best writers working in Spanish today.” I believe, for Bolaño, that qualifies as a glowing endorsement.